The main feature of DMS remains its exceptionally ease of use for the user that lacks any subtitle edition knowledge whatsoever. Besides, below is a complete list of features that made this software an award-winning program in the vast majority of sites where it was published. The program is available in many languages by user-submitted translations, including Arabic, Bulgarian, Catalan, Croatian, Danish, Dutch, English, Finnish, French, German, Greek, Hungarian, Indonesian, Italian, Japanese, Kazakh, Persian, Portugese (Portugal), Portuguese (Brazil), Romanian, Russian, Serbian, Spanish, Swedish and Thai. Make sure you are using the latest version (2.2.0 at the time of writing) which fixes many issues with the subtitles preview feature. 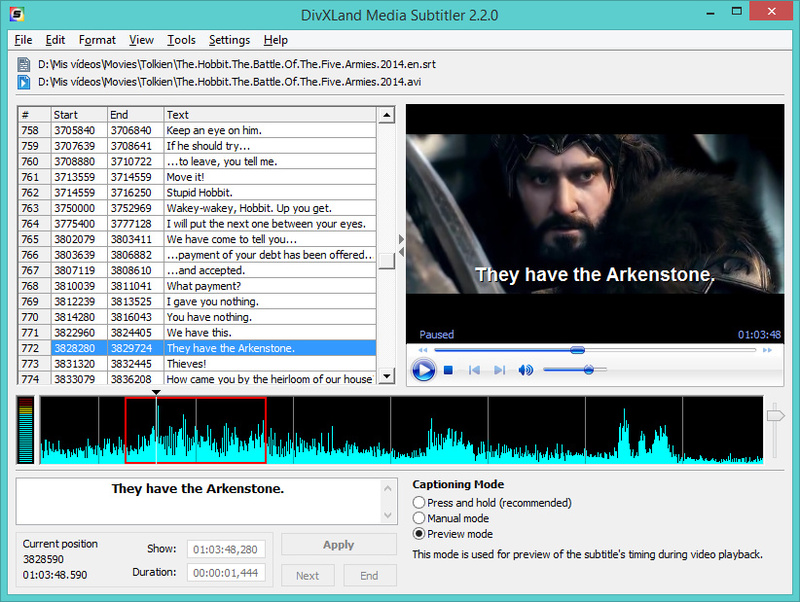 Please visit the official DivXLand Media Subtitler page below to download it.